Bones from fish or chicken can usually be spat onto the table or tablecloth in front of you or onto the floor. One of the first things you will do at the table is to drink tea. Be sure to pour tea for those around you first and your own teacup last. It is considered bad form to fill your own teacup first, or even worse, to only fill your own teacup. Even if the teacups of those around you are full, you should dribble a little into their cup anyway, this is considered polite. If you are the host and have invited other guests to join you, you should make sure your guests always have a full plate and cup. If you are invited to be a guest at a meal, your host will want to ensure that there is more than enough food for everyone. Don't be surprised if your host orders more food to "save face" and prove his generousity and graciousness. Also, don't be surprised if you find your host or others dining with you, putting choice morsels into your rice bowl for you - whether you ask for it or not. This is another sign of generousity and please be sure to accept gracefully. It's not uncommon to see people fighting over the bill in Chinese restaurants. They will try to pull the bill away from someone else at their table and shout with red faces at each other. It is considered polite to offer once or even twice to pay the bill, even if you are the guest. There may be very loud protests to show that they are sincere in wanting to pay the bill themselves, but often it is just a bluff. If you would like to pay the bill without a fight at the table, you can pay the bill the day before or you can sneak off to the washroom and pay the bill at that time. Your Chinese companions will likely show displeasure when they find out, but it will often be welcomed. You have to use your own best judgement when to pay and when not to pay. Please remember, it is not appropriate to always be on the receiving end. In most Chinese restaurants, unless you are in a fancy hotel or very large, modern restaurant, you will want to wash your dishes and utensils before using them. In China, there is not always hot running water for washing dishes and sometimes, the dishes may just get rinsed off – or maybe they are cleaned – but not protected from cockroaches and mice and rats. So, it is best to sanitize everything before beginning – unless you can see that everything is sparkling clean. The entrees you order will be served in bowls and your rice will come in single serving bowls. Entrees are shared dishes. Just take a little at a time from each dish. The dishes usually are not passed around – you must reach to get what you want. If I couldn't reach the dish I wanted, I would ask someone to help me reach the food. The would pick up the food for me and place it into my bowl. In big fancy restaurants and hotels, there are lazy susans, and the food moves around the table several times so you can choose what you like. At a Chinese restaurant, you will generally find on the table a small teacup (without a handle) and a small plate, an empty rice bowl and your chopsticks. The small cup is for tea. The small dish is a refuse plate, for bones and grissle and anything else that is not edible. The first thing you do is ask for a pot of green tea and a large bowl to be brought to your table. If you have disposable wooden chopsticks, take them out of their wrapper, break apart, rub together lengthwise several times to remove any slivers of wood that might get into your food or your mouth, the set them on your small plate. When the tea arrives, stand the chopsticks in the rice bowl or tea cup and pour the boiling tea down the length of the chopsticks. Then swirl the boiling water in the tea cup – making sure to rinse the edges where your lips will touch. Do the same with the rice bowl. Empty the boiling water into the large bowl. The waiter will take it away when you are finished. Don’t count on the table being clean – keep your chopsticks on your rice bowl when not in use. If any food should drop on the table – leave it there – it is considered unfit for eating after it has touched the table. If you want napkins in a Chinese restaurant, you must ask for them. A package of tissue or a roll of toilet paper will be brought to your table. You will pay extra for this. Water is never served free at the table. You need to buy bottled water or sodas with your meal. There is a wide variety of restaurants, from food stalls on the street to one table restaurants to 3 floor restaurants with private rooms. Only in the coastal cities is it common to see women eating in restaurants. In the past and even today in the more rural areas, restaurants are mainly occupied by men. MacDonalds and Kentucky Fried Chicken can also be seen in some of the larger cities. The Chinese have similar fast-food chain restaurants of their own. and there are very popular old-fashioned country-style food restaurants. In the larger cities, coffee shops, tea restaurants and dessert restaurants are starting to pop up. Restaurants that are basically food stalls are for quick, on the run, cheap meals and frequented mostly by students. They are found right outside the gate of the schools and offer fried rice, soups and other local specialties. They also do a brisk breakfast business, serving steamed buns, fried dumplings, congee, noodles, fried rice and other Chinese breakfast fare. One of my favourite breakfasts was cooked on the street on the top of a large metal can. A crepe was made of flour and water. An egg was cracked over the crepe and spread out thinly to cook onto the crepe. Then a piece of twisted fried bread and some hot sauce was set in the center of this very large crepe. When cooked, it was wrapped around the fried bread and handed to you (about the size of a submarine sandwich). You do need to be careful when eating at small Chinese restaurants and food stalls. They are not the cleanest places and you don’t always know what is in the food they are serving. It is easy to get diarhea. For several months, I was buying some fried dumplings on my way to work each morning. They were tasty enough, but I could never quite place what type of meat was in the filling. It was a light grey colour. Upon asking one of my co-workers about the dumplings – they laughed and told me that a lot of the small shops often serve rat meat in the dumplings! I stopped buying dumplings! If there is a group of you, the rule of thumb is order one dish per person plus rice. It is usually at least one vegetable and one meat dish. If you are in the larger cities, you may be lucky enough to come across a restaurant with an English menu. Then you know what you are ordering. However, the translations from Chinese to English are often hilarious and provide a lot of humour over dinner. 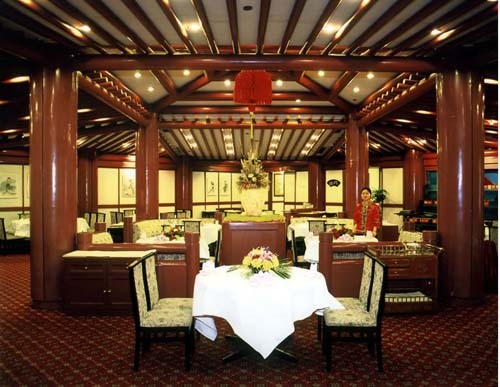 Chinese Restaurant Banquet As a foreigner in China, you will likely be invited to an affair referred to as a Chinese Banquet. This is usually a special event to honor someone. A nice hotel or restaurant will be chosen, and dining will be done in a private room. There is certain etiquette involved. The guest of honor usually is seated at the far side with his back to the wall. Seated next to the guest of honor are the next most important people. Many unusual dishes will be ordered – and too much food will be ordered – all to impress you. As the guest, you will be asked to try each dish and compliment it. If you do not compliment it – you will hurt the feelings of the host. You must at least try a little. It is considered very rude to refuse to try it. So, get ready for thousand year old black eggs, chicken feet, gonads, intestines, brains, fish and in Guangzhou – anything that moves – may be served up! Usually these meals are very heavy on meat and very small on vegetables. The Chinese are very generous and want to give you the best part of any dish – because they think they are honouring you. So don’t be surprised if someone puts a fish eye on your dish, or the head from the chicken. They are trying to be polite. And if they really like you, they will continually fill your dish for you the whole night long. Usually, the guest will be asked what he would like to eat that night. I usually tried to order a vegetable or beef dish, so that I knew there would be something I could eat. It is customary to eat slowly, as the many dishes keep arriving from the kitchen. After about an hour, it is break time. The men will sit back from the table and smoke and drink and chat for a while. Then after about half an hour, they will get back to the job of eating. So, lunch or dinner is never less than 2 hours in the restaurant. You can choose bottled water, tea, hot water, fruit juices, cola and sprite or beer. Drinks are served in very thin, flimsy disposable plastic cups that are easy to tip. Coffee may be available in a good restaurant and usually is available in a hotel. Coffee in China is Maxwell House and comes in single serving packages already doctored with powdered cream and sugar. You can buy bottles of coffee in the supermarket to make your own at home. In the larger cities, you will see western coffee shops like Starbucks. Mister Donut has a few locations in Shanghai. Dessert in a Chinese restaurant is usually some watermelon or apple slices – and it will be served free by the restaurant if you have a large bill. Occasionally, you may be served some steamed bread rolls with icing on the side for dipping. Green mung beans over ice is another favourite in the south. Sometimes there are fried sweet pumpkin or sweet potato pancakes. Amazingly, you can go onto the street in most any town and find a bakery that makes delicious cakes and breads and french style pastries! There are shops dedicated to only special occasion cake making - and the cakes are western style and very delicious - with fruit fillings and light fluffy thick icing. When the meal is finished, someone will announce loudly “zo” – which translates to "GO". And the whole table stops talking and eating, rises and leaves. No lingering. Chinese restaurant banquets were impressive, especially in the quantity of food that was ordered and wasted all to impress me. However, I did not enjoy them too much, as I was obligate to eat strange foods, I was constantly stared at as they looked in awe at a foreigner eating with chopsticks and I usually went home hungry because the dishes ordered were very unusual and not something I would eat. Tip: A fellow foreigner did not want to eat any meat or fish while in China - so he explained that he was a vegetarian to his hosts each time, and he was spared eating some of the very weird dishes that arrived at the table. Chinese restaurants are everywhere you look - big and small. It is reasonable to eat out. It is common for friends to go out together after work and have a meal together and then later go to Karaoke. Many cities have a Night Market Restaurant - and it is on the street and starts at midnight. Many people - especially those who work evenings - or couples - will go down to the night market restaurants and eat open-air on the sidewalk and street - lots of fast food items and nibblies. My Chinese husband taught me a good piece of advise. When looking for a place to eat - always choose the busy ones. If a restaurant has few or no customers - then it is likely that the locals don't like the food here - or it is not clean.